What Happened on Saturday at #NPC19? On Saturday, after Vijay Gupta's inspiring opening keynote, attendees dispersed into neighborhoods on mobile workshops and flocked to sessions on planning. Scroll through the feed for what you may have missed. Check out Sunday, Monday, and Tuesday happenings, too. 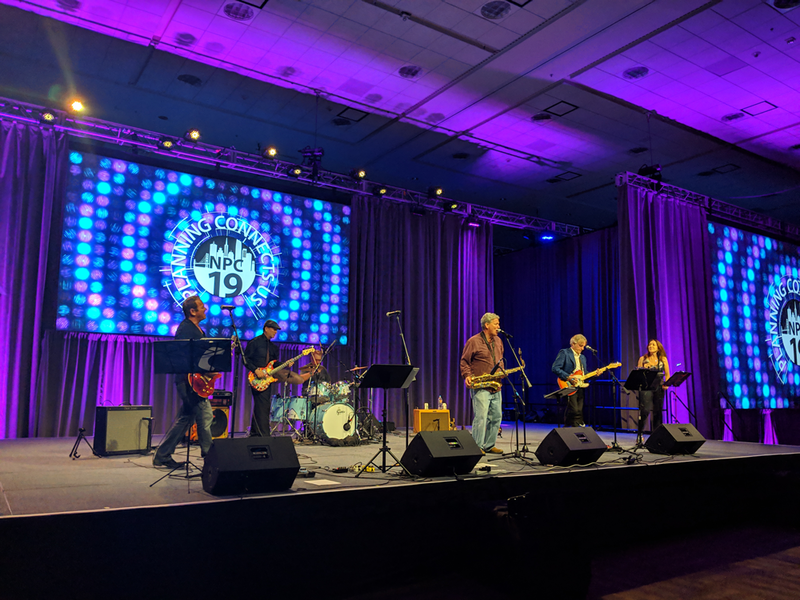 Plan It Rock entertains the crowd at the NPC19 Welcome Reception. Photo by Molly Walsh. The NPC19 Welcome reception was a perfect way to end a successful day one. We jammed to classic rock courtesy of local band, Plan It Rock. Attendees talked about their action-packed first day in San Francisco, exchanged ideas from earlier sessions, and connected with friends (old and new alike). With the beautiful San Francisco sunset in the background, planners from around the country were able to kick back, relax, and enjoy each other’s company. 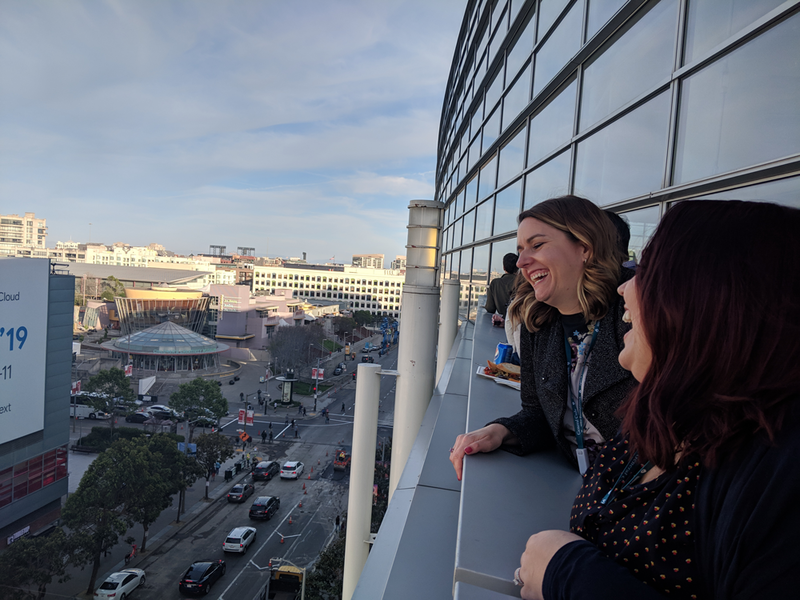 Genevieve Federighi and Victoria Lombardo, AICP, from Tracy, California, enjoy the San Francisco sunset at the Welcome Reception. Photo by Molly Walsh. An all-female panel of speakers made the case for why planners are best-positioned to lead cities and communities. Sponsored by APA’s Women and Planning Division, the Saturday session featured remarks by influential planning leaders who have won seats on councils, commissions, and city government. Jenny A. Brekus, AICP, a planner turned city council member for the City of Reno, Nevada, said her years spent working as a city planner gave her the subject matter expertise and the confidence to move Reno forward on important issues of the day ranging from addressing the housing crisis to connecting people to opportunity. Debra March, mayor of Henderson, Nevada, and a self-described regional planning advocate, noted that her constituents lead regional lives. In this context, she called her experience working on a federal and APA award-winning regional plan invaluable. Taken all together, the panelists proved a valuable reminder that planners are uniquely qualified to advocate and to represent the interests of people living in our communities. The Census is a critical source of information that planners rely on to plan just, healthy, and prosperous communities. The outcomes of the decennial Census affect every person living in the United States in ways ranging from the number of representatives they have in Congress to the number of local projects in their communities supported with federally funded dollars. A Saturday session explored the challenges unique to this census, what is at stake, and what actions planners can take over the next 10 months to support an accurate 2020 Census. Among the strategies spotlighted were helping jurisdictions to develop messaging that underscores the importance of the Census to their community; assisting complete count committees in your area understand where hard-to-count populations reside; and monitoring neighborhood level response rates during the self-response phase of the census, so planners can respond with tailored outreach later on in the process. Maintaining and improving federal data is a top policy priority for APA. In 2018, APA urged Commerce Secretary Wilbur Ross to reconsider and reverse the decision to include a new and untested citizenship question in the 2020 Census. That thought-provoking question was asked by the session presenters and their answer was a resounding yes. The panelists explained that pushback against climate adaptation measures is not that different than pushback sometimes received for other big planning efforts. So how does one manage the pushback? Look for opportunities to fix a problem such as repairing streets and connect that work to climate change objectives. Select your language carefully. While using phrases such as ‘climate change’ and ‘sea level rise’ might not resonate or might no longer resonate within a community, you have the opportunity to reframe the discussion. Communities are often receptive to conversations about ‘flooding,’ ‘hurricanes,’ and King Tides. 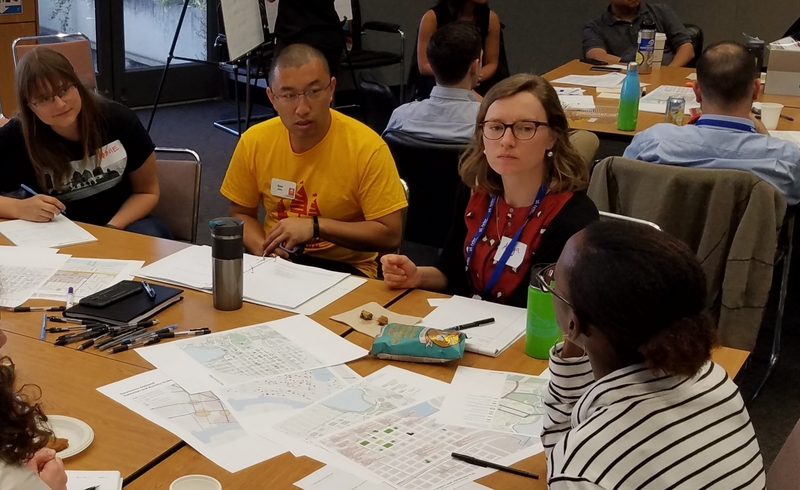 Planners met with local stakeholders in Oakland Chinatown on Saturday for the 2019 AICP Community Planning Workshop. 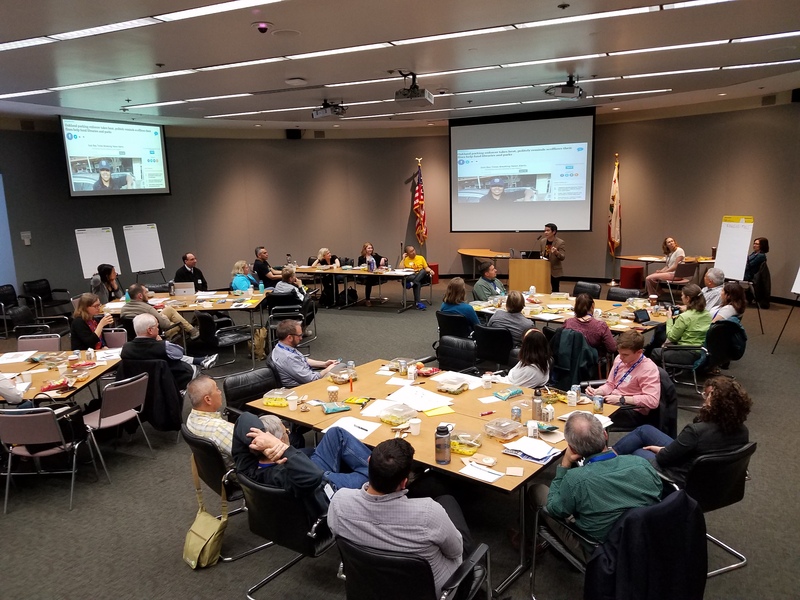 They engaged in a day of focused discussions of ideas being considered by the community, including various financing tools and mechanisms, business improvement districts, cultural districts, and parking benefit districts. Workshop participants toured Oakland Chinatown as part of the day's agenda. Photo by Ryan Scherzinger. Participants toured the neighborhood, and subject matter experts provided presentations on the topics. Breakout group discussions followed, and the day ended with an open discussion with the full group. BART, TransForm, and East Bay Asian Local Development Corporation, a local developer recently selected by BART to develop a site above the Lake Merritt station, will all use the ideas generated and information gained from today's conversations as they move forward with revisions to the conceptual site plan at the station over the next couple of years and continued implementation of the specific plan for the area. The workshop included discussions with the full group. Photo by Ryan Scherzinger. Breakout discussions were part of the workshop day. Photo by Ryan Scherzinger. Mobile Workshop: SF Urbanism, Urban Hiking, and Drinks! 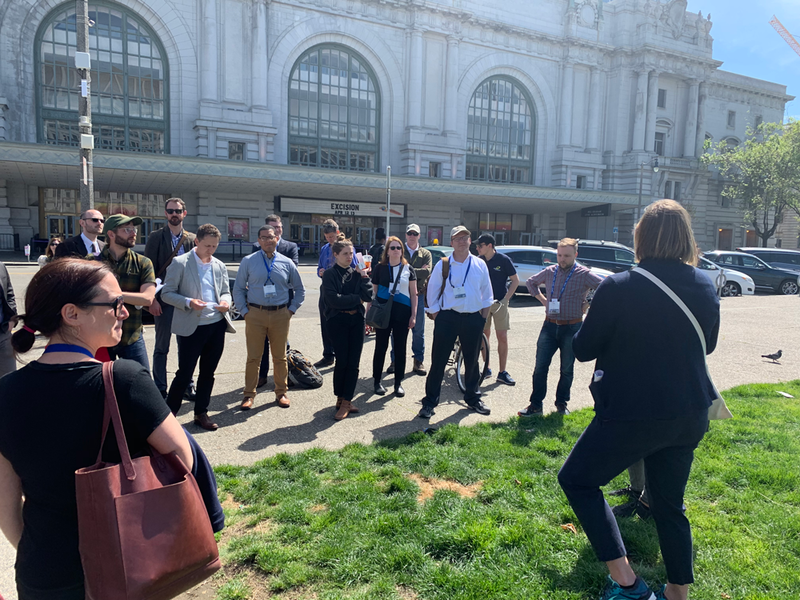 San Francisco is embarking on a multi-departmental, multi-modal makeover of Market Street, the city’s central spine — and NPC19 offered attendees a sneak peek at the innovative project. 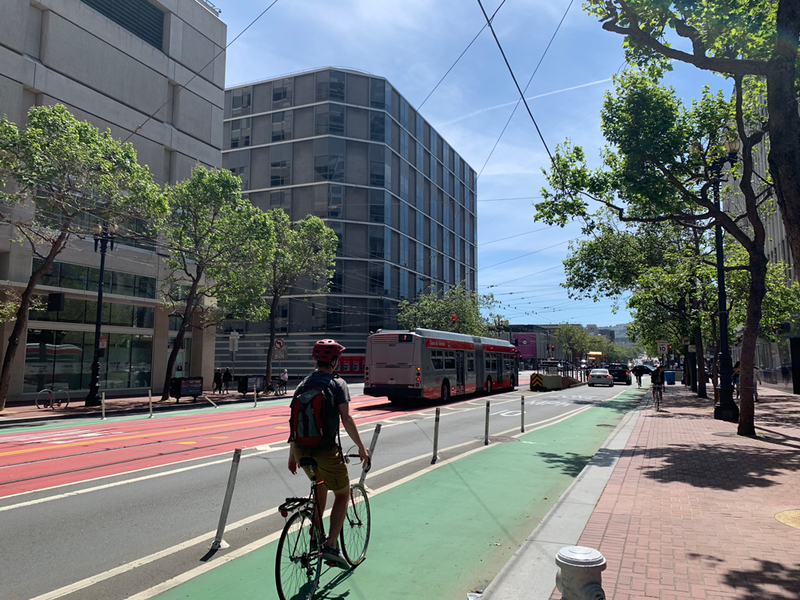 The Better Market Street project includes a full redesign of the city’s central spine to provide dedicated lanes for buses, bikes, and vehicles. Photo by Lindsay Nieman. Provided by the very planners, consultants, and city officials leading the charge, the block-by-block tour dug into the corridor’s existing assets and details of Better Market Street’s planned improvements, including implementing the city’s first sidewalk-level bike lane, banning personal vehicles from select streets, and upzoning parcels to encourage mixed-use high rises along 2.2 miles of the street. When it comes to upzoning, “the big focus is residential towers with ground-floor retail, so that it makes [Market Street] more of a neighborhood sited here in a transit-dense area,” said speaker Alana Callagy, a senior environmental planner for the city. She pointed out a parking lot that could soon become a 500-plus-foot building with retail, a private school, and apartments. Mobile workshop attendees learn about housing elements of Better Market Street from Alana Callagy, a senior environmental planner with the City of San Francisco. Photo by Lindsay Nieman. Attendees were impressed by the project’s consideration of the interplay between housing and transportation — and the collaboration necessary to pull it off. In this Saturday session speakers presented a matrix of metrics for key elements to help ensure that plans are implemented based on three key organizing principles: People, Resources, and Actions. People can be a barrier to implementation but are also vital in making things happen: it’s important to get buy-in from a wide range of political officials and city staff beyond the planning department and to get them to stand behind a unified agenda and inspiring vision. Long-term people are needed to implement long-term ideas. Resources are also key: if you have a good idea and a good team, the resources can better fall into place. These include funding, of course, but also prioritizing action items to better seize opportunities for constantly changing funding sources. And finally, actions are key for implementation: what actions will create the most catalytic opportunities? You need short-term successes to enable the realization of a long-term vision. Making communities “for us, by us” is the impetus behind using cultural planning to drive equity. During this Saturday afternoon session, four panelists from Oakland, California; Washington, D.C.; and Boston detailed the ongoing cultural plans for their cities. While all of their plans highlighted creative, nontraditional approaches to building racial, social, and economic equity, the common thread was this: creating experiences that engage, inspire action, and support creative resolutions to existing infrastructure issues. Next, Sakina Khan, deputy director for Citywide Strategy and Analysis, and Ryan Hand, senior economic planner, both from the DC Office of Planning, discussed Washington’s first-ever cultural plan, aimed at increasing practice and policy recommendations for how government and its partners can support creative placemaking. As defined by the plan, creative placemaking is an arts and culture-forward platform through which the DC Office of Planning engages community and plans by creating experiences that connect people, inspire action, support creativity, and celebrate the unique aspects of neighborhoods. The DC Cultural Plan, which promotes an equitable environment that advances diversity, was developed with the premise that all infrastructure is a stage and every resident is a performer. It seeks to use arts and culture to facilitate a conversation and create cohesion. Roberto Bedoya, cultural affairs manager for the City of Oakland, rounded out the session by discussing ongoing projects in surrounding Oakland neighborhoods. Although Roberto is not a planner by trade, he uses cultural planning to “exert a civil narrative of belonging” among community residents and strengthen the Oakland arts and culture ecosystem. A series of experts tackled some tough questions in this Saturday session on right-of-way management, the role of evolving technologies, and other considerations around what it means for the public right-of-way to truly belong to everyone. The first discussion regarding small cell infrastructure was timely, as panelist Gail Karish not only covered some of the challenges associated with regulations put in place by the Federal Communications Commission (FCC) but advised planners that on April 15 key regulations regarding aesthetics will take effect. Another hot topic? The deployment of electronic scooters. A cautionary tale revealed two important considerations for determining where scooters may be useful and where they could end up causing more harm: density and topography. Whether an e-scooter or small cell infrastructure, technology will continue to evolve at a fast pace and localities will keep working on what this means for their need to regulate the public right-of-way. Planning law professor Alan Weinstein wrapped up in a broader discussion regarding the relationship between the First Amendment and right-of-way. APA Leadership met on Thursday and Friday for a series of council, committee, and business meetings. On Thursday, at the Leadership Plenary, APA President Kurt Christiansen introduced the association's new CEO Joel Albizo to the entire national leadership group. APA leadership at NPC19. APA photo by The Photo Group. In addition to other updates and welcomes, the Leadership Plenary was focused on an update of the organization’s approach to advancing equity, diversity, and inclusion. At the Board of Directors Meeting on Friday, April 12, the Board adopted the report and recommendations of the Social Equity Task Force, which include a roadmap to help our organization and members better address social equity in their practice. The five-point action agenda that was included in the task force’s report will be implemented over the next 18 months. It includes direction for APA to improve the capacity and hard skills of APA members around social equity, including identifying and providing tools and resources, as well as positioning APA to take a leadership role in advancing social equity. The Board also adopted a new Education Blueprint for APA, to guide the development of educational programs across the organization, including on APA Learn. At the AICP Commission Meeting on Thursday, the Commission continued discussion of the work of the CM Evaluation Task Force, and started a strategic discussion about the changing demographics of members and the public and how that might affect how AICP provides value within the organization and to the profession. The Divisions Council had its business meeting as well, including updates from a variety of committees and work groups, and had a discussion about the schedule for conference preparation for NPC20. They were joined by APA staff who presented on policy, advocacy, and education. Following the business meeting, some Division Chairs volunteered for the Divisions Day of Service in Fruitvale while others met for focused sessions on leadership, communication strategies, and sharing resources across divisions. The Chapter Presidents Council had a very productive Business Meeting in San Francisco with discussions that touched base on internal committee updates and new initiatives, education, furthering the Diversity, Inclusion, and Equity at the chapter level. The Student Representatives Council Executive Committee met and conducted a visioning session on what Student Member engagement could mean for APA, and started a larger strategic planning effort for the council for 2019. Autism’s increasing prevalence calls for planners to plan and design the public realm to improve the quality of life for people with autism. At NPC19 on Saturday, attendees learned about a new framework that offers an initial set of planning and design standards that addresses the needs of people with autism. This work was the culmination of a year-long research process that included adults with autism, parent caregivers of adults with autism, professionals from planning and planning-related fields, experts on autism, and graduate and undergraduate students at Ohio State University. Read more about planning with people with autism in an APA blog post, which includes links to more information in PAS Memo and Planning magazine. How to make communities more inclusive, especially when historically disinvested communities start to see redevelopment activity? Ask community residents! This approach was highlighted in a Saturday morning NPC19 session featuring Amit Price Patel of SITELAB Urban Studios and Ben Carlson of Goody Clancy. 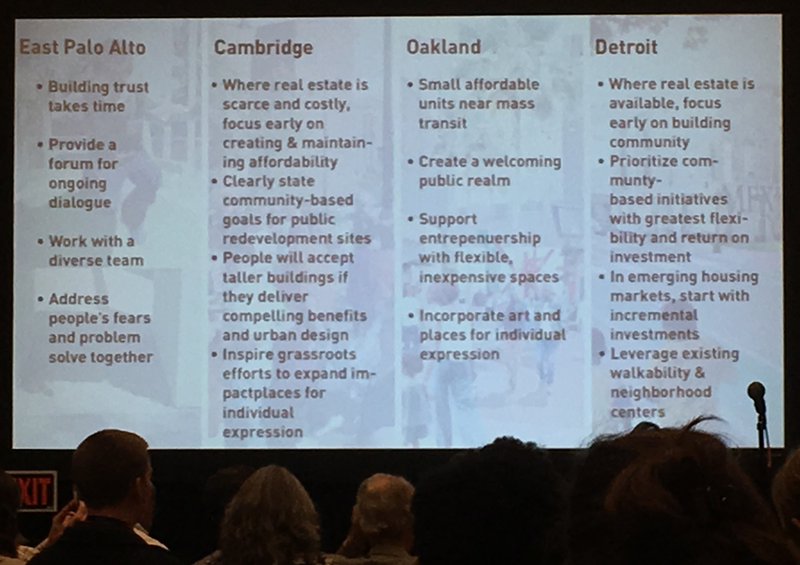 In four case studies from East Palo Alto, California; Cambridge, Massachusetts; West Oakland, California; and Detroit, planning efforts started with engaging the community and asking residents what they wanted and needed to preserve their sense of place and address their fears and concerns about pending redevelopment. Housing successes in four cities were highlighted in the session. Photo by Ann Dillemuth. One theme that emerged was the desire for more public space to provide social gathering places and opportunities for health and fitness activities for residents. In East Palo Alto, this resulted in the design and development of temporary park spaces on underused private land, to which a partnership with the local YMCA brought wildly popular Zumba and yoga classes and creative play spaces engaged children. In Cambridge, community engagement turned NIMBYs into YIMBYs when residents got behind proposed density and building height increases after learning how those changes could enable more affordable housing units to be built and more public amenities to be provided in already highly developed areas. In West Oakland, the redevelopment of three adjacent buildings next to a BART stop provided an opportunity to fill ground-floor retail in the “alleys” between the buildings with flexible incubator spaces providing affordable opportunities for nonprofits and neighborhood entrepreneurs, as well as options for change to accommodate future retail needs and trends, while partnerships with neighborhood partners will shape public spaces in those alleys. And in Detroit, the city committed to investing in streetscape and park improvements in the West Vernor Corridor to celebrate the neighborhood’s Mexican community and enrich public spaces and gatherings. Housing displaced residents during the construction of new affordable housing and offering them the right of first refusal on the new affordable units. Support for exceeding height limits to build taller residential housing. Focus on smaller unit sizes and reduced parking can allow a market-rate approach to providing affordability without requiring subsidies. Smaller, not larger, projects might be the feasible approach for success right now. In NPC19's opening keynote, musician and advocate Vijay Gupta called for us to look at the fragile, vulnerable parts of ourselves to truly see and understand the most fragile and vulnerable people among us. “We have this myth of separateness — [the idea that] I am separate from the man pushing the shopping cart outside this building right now,” Gupta told the standing-room-only audience in San Francisco. But, he said, that person with the cart is us. Street Symphony works in the Skid Row community of Los Angeles, putting social justice at the heart of music making by creating authentic, powerful engagements between professional and emerging artists and communities disenfranchised by homelessness and incarceration. 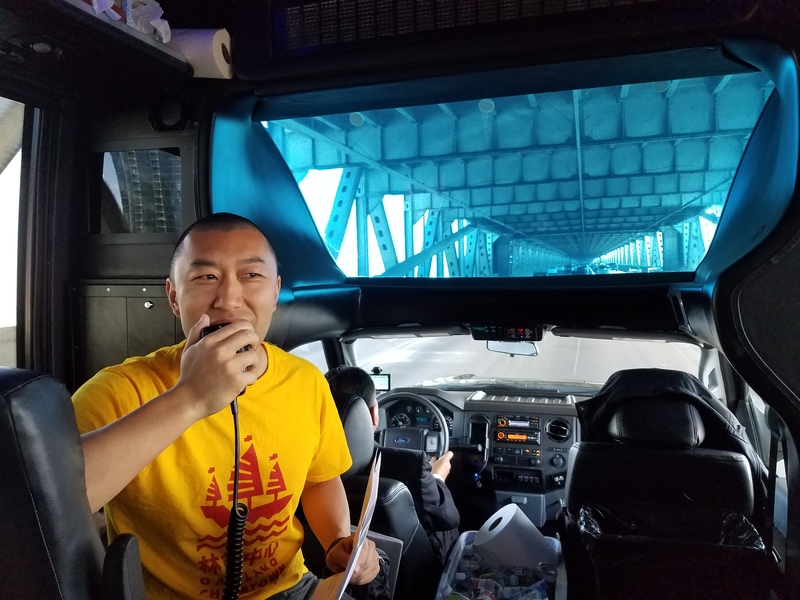 Gupta introduced planners to inspirational musicians, composers, vocalists, DJs, and storytellers who have experienced homelessness, and he played a composition created by a member of that community. In what attendee called on Twitter “maybe the most beautiful opening session in the history of the planning conference,” Gupta’s words and passion, as well as his music, were met with two standing ovations. For some APA Division members, NPC19 began on Friday morning at the Fruitvale TOD Bart Station in Oakland. 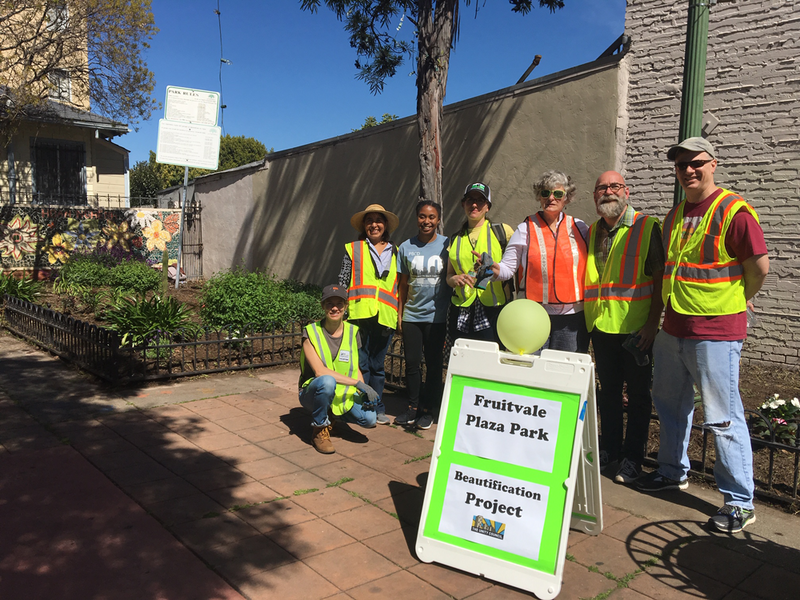 In collaboration with the Fruitvale Unity Council, nine APA Divisions cosponsored a joint day of service to get planners out of the conference center and into the community. Division members, APA leaders, and Fruitvale residents convened at 9:00 a.m. to focus on cleaning and beautifying areas surrounding the train station, working together to pick up trash, tile mosaics on trash receptacles, and weed gardens in a public plaza on International Boulevard. APA division member volunteers and Maria Sanchez of the Fruitvale Unity Council. Photo by Maggie Kraus. Perhaps the most striking and visible effort was the creation of a two-story community mural, designed and led by artist, activist, and Fruitvale native Faviana Rodriguez. 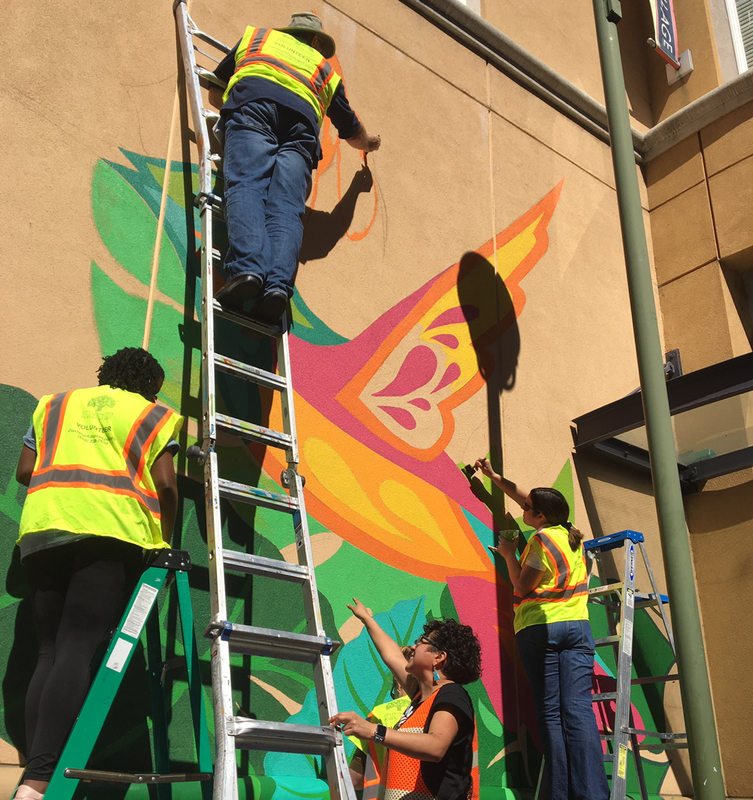 As the day progressed, a vibrant image of a hummingbird took shape on a large wall outside the Unity Council Office. Children and grown-ups alike frequently stopped to admire the mural, thanking volunteers and taking pictures as they passed. Gabriela Juarez, AICP, chair of the Transportation Division, shared her excitement about the mural and the response from those walking by. After months of coordinating with Division members and local partners to secure permits and permission from property owners, it was hard not to feel the energy that poured from the busy intersections. Artist Faviana Rodriguez directs volunteers in the creation of a community mural as part of the Divisions Day of Service. Photo by Maggie Kraus. Top image: Opening Keynote speaker Vijay Gupta played the violin to begin his address. Photo by Harriet Bogdanowicz.